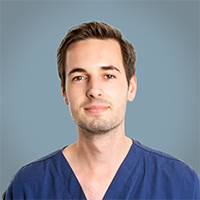 Tijmen qualified as a veterinary surgeon from Ghent University (Belgium) in July 2018. In veterinary school he specialised in small animals and wrote a research thesis on the use of stem cells as a cure for type one diabetes. During his final year he did placements in different services at the teaching hospitals of Cornell University and the University of California, Davis. In July 2018 he started his internship at SCVS. His main interest are internal medicine and oncology and his ambition is to become a specialist in one (or both) of these fields, while maybe doing some research in them as well.